Linda keep on starting the concert threads. Plus I really must add a thank you to everyone else for your reports and photos. Most enjoyable! Ah Gwen, thank you for your kind words. It is indeed an adventure and I hardly know what city I'm in because it's all happening so fast! I don't know how the UHTC keeps up the pace!! If money wasn't an issue the only thing that would keep me away from concerts would be lack of stamina! Good on you for attempting so many in a short space of time! Great pictures Bev, and thanks for your impressions, it's the next best thing to actually being there. B4real thanks for your wonderful report. We've been really hoping to hear The Window too - it is one of my absolute favourite Leonard Cohen songs and it would be incredible to hear it live. We're really hoping it may be added the the set list for the Hill Winery show at Geelong, although it seems unlikely. If you're going to the Hill Winery show and have good seats please do your 'one more' chant again at the end - we will chant the same thing, although will be further back so may not be noticed! We'd love to hear Save the Last Dance For Me which wasn't part of the set list in Melbourne. B4real wrote: Unfortunately, The Window or The Traitor aren't even listed there at all. I would have thought seeing now there is a virtuoso violinist, those songs would be given an airing, especially The Window. But there are still quite a few concerts to go and I’m always hopeful. Let’s see what happens tomorrow night. Thanks for the great concert report Bev... it takes me back to January 31, 2009 when I was there at Bimbadgen, floating around on cloud nine! I totally echo your sentiments above re inclusion of songs suited to the violin and would add to your two songs The Gypsy Wife, which has been performed before in 2012 concerts. I'm adding my thanks to the others you have deservedly received. I'm glad your camera seems to be behaving itself now. Re the printed set list, I'm a bit disappointed that Anthem seems to be an optional close to the first set. I really hope it returns to its proper place for the rest of the tour, especially Sydney Opera House and Adelaide. You are on the way to being a seasoned Travelling Lady now. Looking forward to being adjacent to you in the front row in Adelaide. Thank you everyone! It has indeed been my pleasure to do so. I'm just getting the hang of this travelling thing but it's the connections to and fro the hotels now that are my major concern! Perpetually tired but grateful for the chance to do all this. Alan, I noticed that about anthem too. I think you are right about the light entering my camera and also possibly not using a flash may have contributed to the "arty" photos. He is just one of those performers that radiates a god like presence that is remarkable and quite difficult to describe. I knelt at the altar of Leonard Cohen and saw the light, the magical and mesmerising light that is Leonard. Now I am not a religious person, but I am a spiritual person and I believe in music, so a concert of this sort is some kind of divine intervention for me. And, according to thine own doctrine, many miracles occurred! Firstly, I actually attended an outdoor concert at the vineyards, those that know me have heard my many (many) bleatings of my distaste for such things. I am unsure whether I just had a lucky experience, or someone such as Leonard Cohen is an anomaly to the rule, or I was...wrong...either way I shall go with 1 or 2!!! Secondly, the weather, which had been hideous, behaved. L and I had light rain heading to Bimbadgen, and by the time we arrived sun was peering through all the clouds. Not only did we have NO rain, wind or any other kind of weather that would ruin an outdoor concert, we actually got a bit too much sun. And of course lastly, we got to see Leonard! Supporting Leonard was the amazing Adalita, what a voice and she is also a great guitarist. We had time to find our seats, which were in a decent spot and enjoy L's afternoon tea of Camembert, pear paste and truffle salami. After Adalita, I took off for a bottle of something something, which I found reasonably priced! And then the second act, Archie Roach, came on. What a divine voice, truly Australian royalty. Such class and dignity, and lovely tales to be told in between songs. We then had my zucchini pie for dinner with more lovely bubbles. As the sun started to slowly set, a voice announced Leonard Cohen in 10 minutes, then 5. We gasped as the band entered the stage, all in suits and looking suave. And then he glided onto stage, in a suit, thin tie and a stylish hat, and begun the first song, Dance me to the end of love. One of my favourites, I had tears in my eyes but had no idea the places we would go in the next three and a bit hours. Yes! He played for roughly three hours, a first set, a short intermission, a second set and three encores, it started just on 7pm and was finished around 10.15...not bad for a 79 year old! His band was remarkable, a United Nations of supreme musicians. To his left a trio of strings: a guitarist, Javier from Spain, who played a mean flamenco on 12 string guitar and Bandurria (also 12 strings and sort of sounds like a Mandolin); Alexandru from Moldova, on the violin; and Mitch Watkins on guitars. To his right, Roscoe Beck, tour producer and Bass player, and the sublime Sharon Robinson, song collaborator and back-up singer with the stunning Webb Sisters and their beautiful harmonies, guitar and harp work. Behind them, Maestro Neil Larsen on keyboards and Mexican, Rafael 'keeping time' on drums. They were a tight and talented group of musicians and a pleasure to behold their music. And you could tell Leonard knew this, his grace and awe of their musicianship was on display all night, as he doffed his hat and held it to his chest as each of them took turns in solos and introduced them all at least three times. But Leonard shone with and without them, his voice just gets better with age, those deep baritones with a thick timbre that is unmistakably him! He was a powerful performer, dropping to his knees constantly or slowly dancing in a style that is unlike no other. He had a jaunty skip in his step each time he left the stage and then would almost immediately float back on. He gave and gave, to us, his 'friends.' He knew how to linger on a poignant line. And those words, poetry without the music, such beauty in every syllable, such pain and love and loss and delight. Leonard knows it all I swear, that face tells more stories than the words that exit his mouth and we were all the wiser and happier for it. I've since read a few reviews of previous concerts and it would appear some of the sequences and schtick are replicated each night, however watching it you would never know, it did not seem rehearsed or perfunctory, just heartfelt and sincere. It's difficult for me to select favourite moments as the evening was so divine. It was incredibly special sitting outside on a balmy evening (especially when those around us actually behaved!) looking towards the stage with the sun setting behind us and the mountains in the distance surrounded by the colours of the sunset. Hearing Dance me to the end of love, Tower of song and Hallelujah - my three favourites - sung left me weeping with joy. And of course just absorbing Leonard himself, his poise and grace, his distinctive moves, his voice, his humour, his honesty and fragility and his warmth and love of us, his friends. It's a one of a kind experience, one you mustn't pass on if you ever get the opportunity. He is just one of those performers that radiates a god like presence that is remarkable and quite difficult to describe. 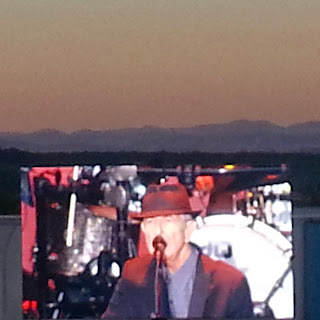 And a blog review from a friend experiencing their first Leonard Cohen concert. "It's a one of a kind experience, one you mustn't pass on if you ever get the opportunity. He is just one of those performers that radiates a god like presence that is remarkable and quite difficult to describe." I'd never been to A Day On The Green before this event at Bimbadgen Estate but I don't know what the hell took me so long. The drawcard that finally got me there was Leonard Cohen - more about his brilliant set later - but the event itself was worth the trip to the Hunter Valley. The relaxed atmosphere, the beautiful location overlooking mountain ranges, the easy-to-navigate site - there's hardly a better way to experience live music with friends or family. And of course there's the wine (more gigs at wineries, please). After 12 years of putting on these shows, the organisers of A Day On The Green have cultivated an event that runs as smoothly as you could hope for. As the crowd lined up outside the venue at the very civilised time of 3pm, folding chairs and picnic blankets at the ready, we were braced for a day in the wet. Miraculously, the clouds began to part minutes after the gates opened, and it was sunshine and clear skies for the remainder of the event (a complete turn-around from the preceding 24 hours or so). So we took off our rain ponchos and got down to the business of staking out a spot of the grass with the best possible view of the stage, then settled in for some pre-show drinks and snacks. First up on stage was Aussie rocker Adalita, who delivered a solid set of achingly introspective tunes from her two solo albums. Going it alone for her opening number before being accompanied by a bass player, the former Magic Dirt frontwoman was in great voice and was as captivating as ever. Adalita's grungey guitar sound contrasted nicely with the serene backdrop, although it was a little on the heavy side for some in the audience. Still, nobody held back their applause. The second support slot was filled by Archie Roach, who had the crowd in the palm of his hand throughout his set without even needing to get out of his seat. Roach's personal history and humility saturate every song he plays in a way that puts a smile on your face and a tear in your eye, as did his tribute to late wife Ruby Hunter. Stories were told and old favourites like 'Walking Into Doors', 'Beggar Man' and 'A Child Was Born Here' were met with wild cheers from the crowd. As sunset approached, anticipation was growing for the man of the moment, Leonard Cohen. It has to be said that there was also a sense of apprehension in the air - at 79 years of age, could Cohen still hold a tune? Has he still "got it"? Suited up like the dapper gent he is, Cohen casually walked onto the stage and only had to sing the first line of opening number 'Dance Me To The End Of Love' to assure us that he hadn't lost his gift of a golden voice. Perhaps the best word to describe Cohen as a performer is generous. Hat on heart, he heaps praise on his exceedingly talented band and back-up singers, and continually thanks his "friends" in the audience. These statements aren't just throw-away niceties, as his gratitude seems completely sincere. But he is also generous on another level: By giving all of himself to songs that he's performed countless times over the decades, he's able to create an intimate atmosphere in a venue of any size. Bimbadgen's outdoor amphitheatre was no exception. Whether you were near the front, in the middle or up the back, it felt like the man was giving you a hug through song. Okay, maybe it didn't feel that special for the novel-reading teenager whose parents had clearly dragged him along to the show, but for everyone else, Cohen strikes a nerve that only the best performers can. It never feels like he's going through the motions - he's invested completely in every song. And what songs they are. It's almost an embarrassment of riches the amount of great tracks Cohen provides in one show, the first section of which included 'Bird On A Wire', 'Everybody Knows' and 'Who By Fire' in succession, and later 'Lover, Lover, Lover', which prompted the first of many audience sing-alongs. After literally skipping off the stage for a brief intermission, which provided everyone with the opportunity to replenish their drink supply and take a bathroom break, Cohen was back with another nine tracks, starting with 'Tower of Song'. It's almost pointless to mention song highlights in a Leonard Cohen set because it's a case of classic after classic after classic, but this section also featured 'I'm Your Man' and 'Chelsea Hotel #2'. The way he smirked as he sang "You told me then you preferred handsome men, but for me you'd make an exception" had the crowd roaring. Cohen's sense of humour, like his voice, was in fine form. Cohen's abilities as both poet and showman were perhaps most apparent as he recited 'A Thousand Kisses Deep'. When was the last time you stood with a few thousand other people transfixed by someone reciting poetry? The second part of his set also included a certain song that, for better or worse, has become Cohen's best known "hit": Yup, you guessed it, 'Hallelujah'. This track has been covered so many times it's something of a cliché, but back in Cohen's hands it holds up as the masterpiece it is. Another memorable moment of this section was when Cohen's long time collaborator Sharon Robinson took vocal duties on an exquisite rendition of 'Alexandra Leaving' (there's that Leonard Cohen generosity again). There was more audience involvement as we clapped to the beat and sang along to 'Take This Waltz', which concluded the main set before Cohen again left the stage. By this point, nobody really expected the show to be over but eveyone still rose to their feet and offered their applause. Soon enough, Cohen returned with an encore of 'So Long, Marianne', 'Going Home' and an invigorating 'First We Take Manhattan'. There'd be no more sitting at this concert. One encore down and so many amazing songs performed, a satisfied audience wondered if it was all over while not-so-secretly hoping it wasn't. Our cheers were soon rewarded with another three-song encore, which featured Cohen's other backing singers, The Webb sisters, performing 'If It Be Your Will' and Cohen closing with, appropriately, 'Closing Time'. After two encores, the clock was ticking past the scheduled finishing time of 10pm, so surely the gig would be over now. Wrong again. Cohen extended his masterfully crafted set by stepping back onto stage and singing "I tried to leave you," from the song of the same name, pausing for comedic effect before continuing to more cheers. For his fourth and final encore, Cohen kept the audience on a high with a cover of The Drifters' 'Save The Last Dance For Me'. Sure, 'Don't Go Home With Your Hard On' would've been a fun way to finish too... but maybe next time. After 27 songs and a tick on the bucket lists of many an audience member, the unforgettable gig had come to an end. Strolling out to the shuttle buses for the trip home, long-time Leonard Cohen devotees wondered whether they'd just seen the legend live in concert for the last time while double checking the line-up for the next installment of A Day On The Green.